September 23, 2016 1:00 P.M.
Ontario's provincial parks offer great opportunities to view beautiful fall colours throughout the province. The Ontario Parks Fall Colour Report shows you when colours are at their peak in provincial parks across Ontario. Different parks experience the changing colours at different times, so be sure to check the report before heading out. Lake Superior and Ouimet Canyon in the northwest. Ontario Parks also offer some ideas for driving routes so you can build your park visit into a day-long adventure. In 2015, Ontario’s provincial parks received more than 9.8 million visits from people around the world and brought in over $80 million in revenue, which supports jobs and businesses across the province. 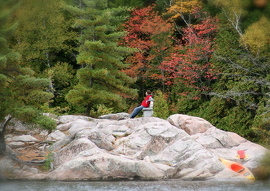 Some of the most brightly coloured fall foliage in the world occurs in Ontario. About 66 per cent Ontario is forested with about 85 billion trees. Almost 40 per cent of those are deciduous and shed their leaves. There are more than 330 provincial parks in Ontario, covering more than eight-million hectares — an area larger than Nova Scotia and Prince Edward Island combined. This document was published on September 23, 2016 and is provided for archival and research purposes. Let the fall colours begin!